When style counts, you need to wear the right shoes whether you're seen cavorting in a Zoot Suit or any other type of fashion suit. You can't just put on a swinging zoot suit and then just put on any old shoes you have laying in your closet. You need a pair of spectator shoes. I've been a fan of Giorgio Brutini Dress Shoes for years. Nothing beats the combination of style, quality and value that all Giorgio Brutini Dress Shoes come with. 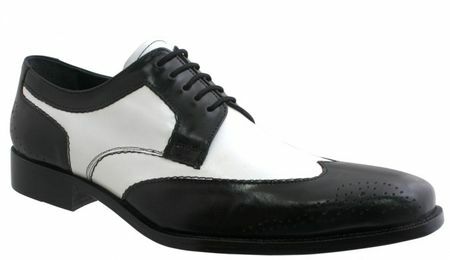 These Unmistakably Italian Style Giorgio Brutini Black and White Leather Wing tip dress shoes are just the what the well dressed man should wear when style counts. You will glide on the dance floor like never before when you slip on these black and white spectator shoes with the all leather soles. It's not every day you need to wear a pair of black and white wingtip dress shoes but when the time comes, you need to take a look at what the house of Giorgio Brutini knows how to make. These wonderful and exquisite calfskin leather wingtip shoes will make it know how well made they are. The leather is high quality and you'll know that you'll be able get plenty of use out these rich Italian style wingtip shoes.